Mrs. Alan G. Law (née Annie Mather Morrice), sister of James Wilson Morrice, before 1925; Bequeathed to private collection, Quebec; By descent to present private collection, Quebec. 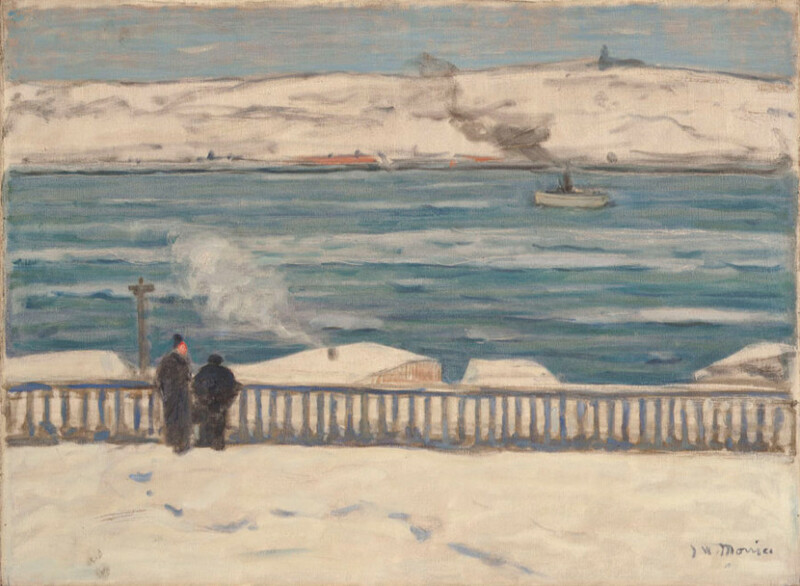 - Mme Alan G. Law (née Annie Mather Morrice), soeur de James Wilson Morrice, avant 1925; Collection particulière, Québec; Par descendance, collection particulière, Québec. 1909 - Salon, Société Nationale des Beaux-arts - Paris, Grand Palais, April 15 to June 30, no. 879 as Québec. Work identified by a letter from John LYMAN to his father, 26 May 1909, and a short description in French magazine Les Arts (see BIBLIOGRAPHY). 1910 - 14th Annual Exhibition, Carnegie Institute, Pittsburgh - 2 May / 30 June, no. 208 as Quebec: Winter. Work identified by label on the stretcher and a letter from Morrice to J.W. Beatty, Director, Carnegie Institute, July 1, 1909 (see BIBLIOGRAPHY). 1925 - Memorial Exhibition of Paintings by James W. Morrice, R.C.A. Montreal, Art Association of Montreal, Jan. 16 to Feb. 15. Cat. 62 as Quebec in Winter. Work identified by a short description of No. 62 in a review in Canadian Forum (see BIBLIOGRAPHY). 1937-38 - Memorial Exhibition. Ottawa, National Gallery of Canada, Nov. 15 to Dec. 27. Also shown in Toronto, Art Gallery of Toronto, January 1938, and Montreal, Art Association of Montreal, February 1938. Cat. 67 as View Towards Levis from Quebec. 1953-54 - Royal Canadian Academy of Art, 74th Annual Exhibition, Memorial Section: Drawings and paintings by J.W. Morrice, 1865-1924. Toronto, Art Gallery of Toronto, Nov. 27 to Jan. 10th, 1954. Cat. 22 as View Towards Levis from Quebec. 1965 - James Wilson Morrice: 1865-1924. Montréal, Musée des Beaux-Arts / Montreal Museum of Fine Arts, Sep. 30 to Oct. 31; also shown in Ottawa, National Gallery of Canada, Nov. 12 to Dec. 5. Cat no. 15 as View Towards Levis from Quebec (Quebec, Winter) / En regardant Lévis de Québec (Hiver, Québec). 1998 - Homage to Walter Klinkhoff (Part I). Montreal, Galerie Walter Klinkhoff, Sept. 12-26. A rare selection of works that Mr. Klinkhoff had particularly liked. - 1909 - Salon, Société Nationale des Beaux-arts - Paris, Grand Palais, du 15 avril au 30 juin, no 879, intitulée Québec; 1910 - 14th Annual Exhibition, Carnegie Institute, Pittsburgh - 2 mai / 30 juin, no 208 intitulée Quebec: Winter. 1925 - Memorial Exhibition of Paintings by James W. Morrice, R.C.A. Montréal, Art Association of Montreal, du 16 jan au 15 fév. Cat. 62 intitulée Quebec in Winter. 1937-38 - Exposition commemorative. Ottawa, Musée des beaux-arts du Canada, du 15 nov. au 27 déc. ; Toronto, Art Gallery of Toronto, janvier 1938, et la Montreal, Art Association of Montreal, février 1938. Cat 67 intitulée View Towards Levis from Quebec. 1953-54 - Académie royale des arts du Canada, 74e exposition annuelle, Section commemorative: Drawings and paintings by J.W. Morrice, 1865-1924. Toronto, Art Gallery of Toronto, 27 nov au 10 jan, 1954. Cat 22 intitulée View Towards Levis from Quebec. 1965 - James Wilson Morrice: 1865-1924. Montréal, Musée des Beaux-Arts, du 30 sept au 31 oct; Musée nationale des beaux-arts du Canada, du 12 ov au 5 déc. Cat no 15 intitulée View Towards Levis from Quebec (QuebecWinter) / En regardant Lévis de Québec (Hiver, Québec). 1998 - Hommage à Walter Klinkhoff (Partie I). Montréal, Galerie Walter Klinkhoff, du 12-26 sept.
1909 - Salon, Société Nationale des Beaux-arts - Paris, Grand Palais, April 15 to June 30, no. 879 as Québec. Work identified by a letter from John LYMAN to his father, 26 May 1909, and a short description in French magazine Les Arts (see BIBLIOGRAPHY). 1910 - 14th Annual Exhibition, Carnegie Institute, Pittsburgh - 2 May / 30 June, no. 208 as Quebec: Winter. Work identified by label on the stretcher and a letter from Morrice to J.W. Beatty, Director, Carnegie Institute, July 1, 1909 (see BIBLIOGRAPHY). 1925 - Memorial Exhibition of Paintings by James W. Morrice, R.C.A. Montreal, Art Association of Montreal, Jan. 16 to Feb. 15. Cat. 62 as Quebec in Winter. Work identified by a short description of No. 62 in a review in Canadian Forum (see BIBLIOGRAPHY). 1937-38 - Memorial Exhibition. Ottawa, National Gallery of Canada, Nov. 15 to Dec. 27. Also shown in Toronto, Art Gallery of Toronto, January 1938, and Montreal, Art Association of Montreal, February 1938. Cat. 67 as View Towards Levis from Quebec. 1953-54 - Royal Canadian Academy of Art, 74th Annual Exhibition, Memorial Section: Drawings and paintings by J.W. Morrice, 1865-1924. Toronto, Art Gallery of Toronto, Nov. 27 to Jan. 10th, 1954. Cat. 22 as View Towards Levis from Quebec. 1965 - James Wilson Morrice: 1865-1924. Montréal, Musée des Beaux-Arts / Montreal Museum of Fine Arts, Sep. 30 to Oct. 31; also shown in Ottawa, National Gallery of Canada, Nov. 12 to Dec. 5. Cat no. 15 as View Towards Levis from Quebec (Quebec Winter) / En regardant Lévis de Québec (Hiver, Québec). 1998 - Homage to Walter Klinkhoff (Part I). Montreal, Galerie Walter Klinkhoff, Sept. 12-26. A rare selection of works that Mr. Klinkhoff had particularly liked. - D.W. Buchanan, James Wilson Morrice, 1936, p. 157. Signed J.W. Morrice. Labels: (1) 1910 Annual Exhibition, Carnegie Institute (on the stretcher): “... CARNEGIE INSTITUTE, PITTSBURGH, U.S.A. / TITLE Quebec, Winter / ARTIST J.W. Morrice / OWNER artist / ADDRESS 45 (Quai) des Grands- Augustins Paris / ATT: CURELY ”, details (in italics) written by Morrice himself. There is also the label from the Shipping Agent, P. NAVEZ, Paris; (2) 1998 Homage to Walter Klinkhoff, Exhibition at Galerie Walter Klinkhoff (on the stretcher); (3) (detached) 1965 Montreal Museum of Fine Arts Morrice exhibition. Signée J.W. Morrice.